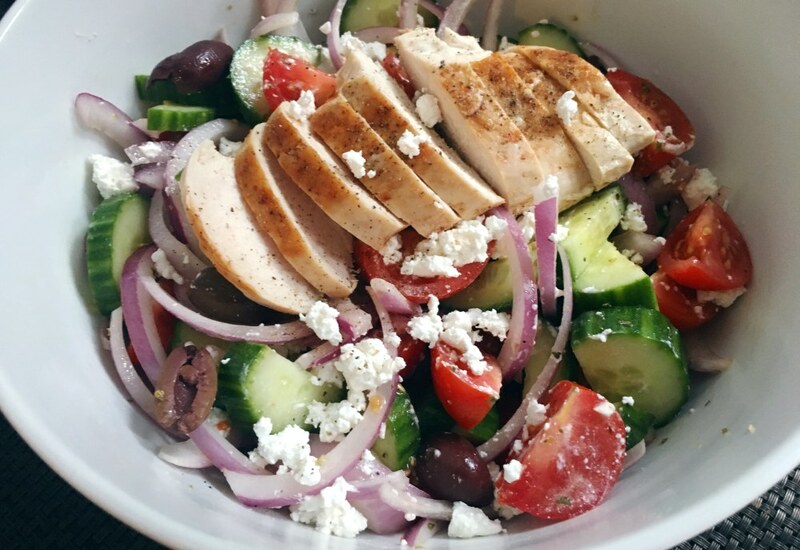 This healthy and delicious recipe is a riff on a traditional Greek salad. Use leftover or store-bought rotisserie chicken for a quick and easy meal. For optimal flavor, select a high-quality extra virgin Greek olive oil. This is an ingredient of exceptional quality, aroma, and taste that will find its way into every bite of this salad. Extra virgin olive oil comes from the first pressing of the olives, and no chemicals or hot water are added during processing. Bulgarian feta in the brine tends to be creamier than other varieties and can make a big difference in the final result. This recipe is perfect for a healthy weeknight dinner, but can also be packed for lunch on-the-go at school or work. Per Serving: 680 calories; 48g fat; 19.2g carbohydrates; 46g protein; 135mg cholesterol; 1009mg sodium. I'm a sucker for a Greek salad! I particularly love this recipe because the homemade dressing is really good, the red wine vinegar really stands out. It also tastes excellent with grilled meats, you don't have to use chicken. This is one of my favorite salad recipes. Whenever I make this dish, I always add extra chicken for my husband. The red wine vinegar dressing is also really good and I use it on other salads as well. Made this salad with shrimp instead of chicken. It was really delicious and light. I also add chickpeas (canned). If you like Mediterranean food, you’ll enjoy this.